How fast do things change on Mars? On Earth, it is assumed that in a period of a dozen years a sand dune would change significantly. Wind and rain and the yearly cycle of the seasons would work their will, reshaping and moving the dune steadily from one place to another. On Mars, we would be reasonable to expect the same. 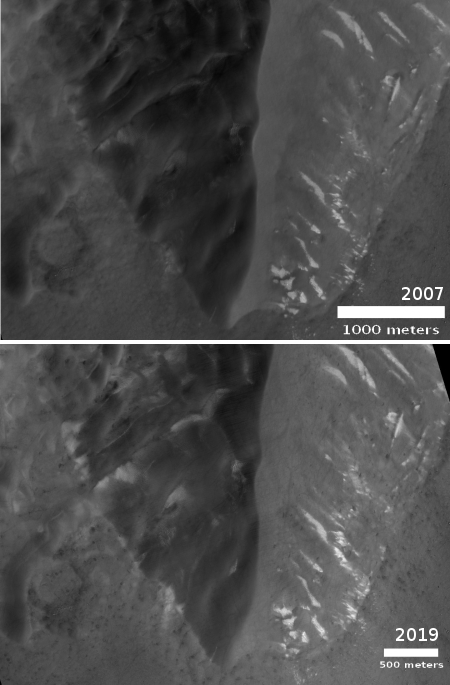 Yet, this might be a mistake, as illustrated by the two images on the right, taken by cameras on Mars Reconnaissance Orbiter (MRO) a dozen years apart of the same large dune located in a crater far to the south in the planet’s southern highlands. 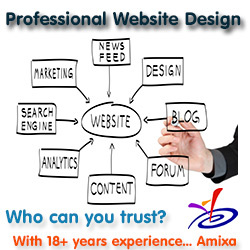 Both images have been cropped and reduced in resolution to show here. For the full images, go here for 2007 and here for 2019. 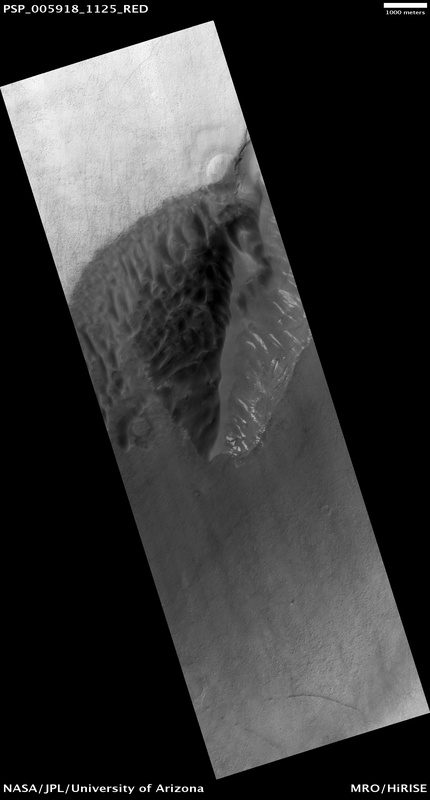 The top image was taken October 31, 2007 by MRO’s context camera. 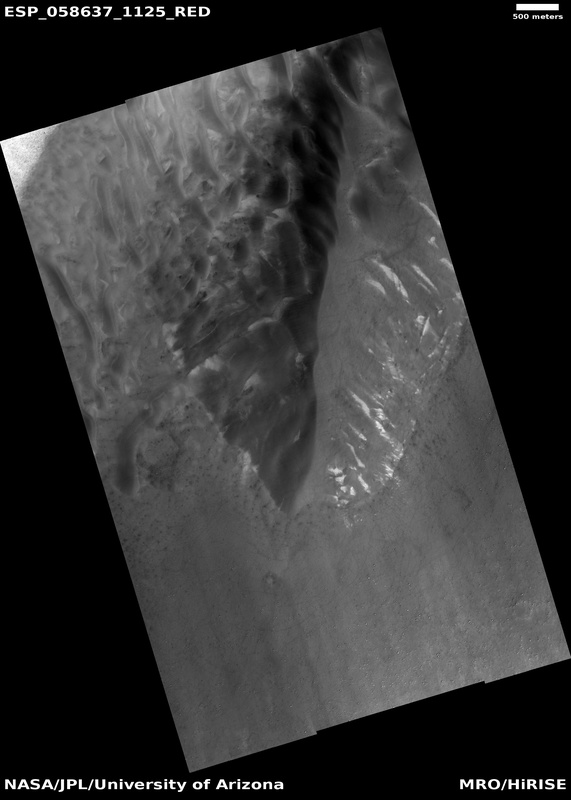 The bottom image was taken on January 29, 2019 by MRO’s high resolution camera. Though the context camera does not have the resolution of the high resolution camera, the difference is of less significance in this context. Have things changed? Putting aside lighting differences, it does appear that the white patches have changed slightly in a variety of places. There also might be changes in the small dunes on the left of the image, at the base of the large central dune. The white patches are probably what interests the scientists who requested the second image. Could this be snow or frost, as is thought to exist in other places? There are studies [pdf] that expect ice to exist inside craters near the south pole. Identifying changes here would help answer this question. Overall, however, not much is different. Though dunes definitely change on Mars, they do so much more slowly than on Earth. And in some cases what look like dunes are not really dunes at all, but a form of cemented sandstone, exhibiting even fewer changes over long time spans. I do not know if these dunes are of sand or sandstone. What the two images reveal is that in either case, things do not change on Mars at the same pace as they do on Earth. Even after three Martian years, the thin Martian atmosphere simply doesn’t have the same energy as on Earth, even though it can move things easier in the weak gravity. While the pole caps of Mars change a lot seasonally, the rest of the planet evolves very slowly. Mars is no longer an active planet like the Earth. It is, in many ways, a dead planet, once alive with activity but now silent and relatively quiet.